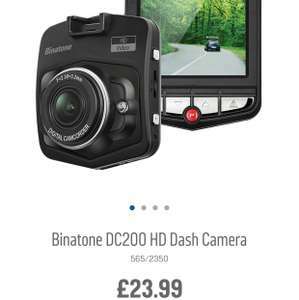 Binatone Dc200 HD Dash Camera 5652350 @ Argos for £23.99 dropped from £39.99. Great reviews. This looks identical to the £6 TomTop camera everyone bought recently. If it is the same, its utter rubbish & I cannot understand how Argos users have reviewed it so well. From resolution, to viewing angles to reliability...this thing is a liability. This looks identical to the £6 TomTop camera everyone bought recently. If …This looks identical to the £6 TomTop camera everyone bought recently. If it is the same, its utter rubbish & I cannot understand how Argos users have reviewed it so well. From resolution, to viewing angles to reliability...this thing is a liability. Likely they have only viewed recorded footage on the inbuilt screen. No. They were dire. Funnily enough yesterday my mate called me to ask about micro sd cards, for a dash cam - I went on to tell him about my crap, only to go round and find out his is identical (from Argos). I haven't seen the video yet though. I told him about the battery lasting like 30 secs, and he said his does the same. They look very similar except the Argos one has 2 silver side buttons but otherwise look identical. The problem is so many clones it's hard to know who makes what, even semi well known dash cam companies seem to sub contract the work to different factories in China so quality varies tremendously. No. They were dire. Funnily enough yesterday my mate called me to ask …No. They were dire. Funnily enough yesterday my mate called me to ask about micro sd cards, for a dash cam - I went on to tell him about my crap, only to go round and find out his is identical (from Argos). I haven't seen the video yet though. I told him about the battery lasting like 30 secs, and he said his does the same. The battery on ALL dashcams is only enough to save videos and close down, a few might last a few minutes, and let you replay a video but they are not meant to be run this way. The Yi dashcam at Amazon posted on this site is amazing value for 30 quid and will bet this one into the ground. The battery on ALL dashcams is only enough to save videos and close down, …The battery on ALL dashcams is only enough to save videos and close down, a few might last a few minutes, and let you replay a video but they are not meant to be run this way.The Yi dashcam at Amazon posted on this site is amazing value for 30 quid and will bet this one into the ground. I expect it's a lot better. Basically the one I got from Tomtop had different innards from what were advertised, the battery issue wasn't such a biggie as the terrible video quality that would be unusable should you actually need it. By the way, nice to see you on here again - haven't seen you for years! I expect it's a lot better. Basically the one I got from Tomtop had …I expect it's a lot better. Basically the one I got from Tomtop had different innards from what were advertised, the battery issue wasn't such a biggie as the terrible video quality that would be unusable should you actually need it.By the way, nice to see you on here again - haven't seen you for years! I only install the best make cameras in my car, thinkware. Not cheap but nothing comes close. Tried them all past 10 years or so. Cheap ones. Winycam. Blackvue. Blackvue and winycam cause dab issues. Cheap ones and mini series like the 806 have appalling build quality or awful suction holders and poor parking mode or low light capability. 806 day time pic quality was pretty good but build quality was dreadful. Thinkware now have cloud like blackvue but it's fat better and also in next few months it will be even better with parking incident alerts sent to your phone when someone crashes into your parked car when you are not in it including a vid of the incident. what do people do when they park car is it visible from outside of the car or one have to remove it eveytime? if so bit of hassle i guess. So is it better to go for the ebay links? Cheapest seems to be GBP 6 which is reasonable.